U.S. Highway 66 — popularly known as Route 66 — holds a special place in American consciousness. Its name commonly evokes images of simpler times, mom-and-pop businesses, and the icons of a mobile nation on the road. Travelers on Highway 66 today can easily experience this past, as many of the motels, gas stations, cafés, parks, trading posts, bridges, and roadbeds remain along the thoroughfare. These historic resources are reminders of our past and evidence of the origins of our current automobile-influenced society. Route 66 embodies a complex, rich history that goes well beyond any chronicle of the road itself. An artery of transportation, an agent of social transformation, and a remnant of America’s past, it stretches 2,400 miles across two-thirds of the continent. The highway winds from the shores of Lake Michigan across the agricultural fields of Illinois, to the rolling hills of the Missouri Ozarks, through the mining towns of Kansas, across Oklahoma where the woodlands of the East meet the open plains of the West, to the open ranch lands of Texas, the enchanted mesa lands of New Mexico and Arizona, to the Mojave Desert, and finally to the “land of milk and honey” – the metropolis of Los Angeles and the shores of the Pacific Ocean. Flanked by historic buildings and diverse cultural resources, Route 66 slices across the continent, revealing the process of historical change that transformed the lives of people, their communities, and the nation. This fabled highway’s multiple alignments connect not only the East and the West, but also the past and the present. Route 66 had its official beginnings in 1926 when the Bureau of Public Roads launched the nation’s first Federal highway system. Like other highways in the system, the path of Route 66 was a cobbling together of existing local, State, and national roads. 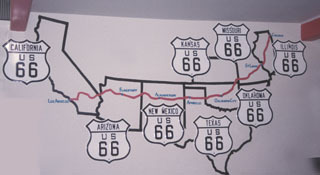 The highway quickly became a popular route because of the active promotion of the U.S 66 Highway Association, which advertised it as “the shortest, best and most scenic route from Chicago through St. Louis to Los Angeles. Merchants in small and large towns along the highway looked to Route 66 as an opportunity for attracting new revenue to their often rural and isolated communities. As the highway became busier, the roadbed received improvements, and the infrastructure of support businesses — especially those offering fuel, lodging, and food that lined its right of way — expanded. Even with tough times, the Depression that worked its baleful consequences on the nation produced an ironic effect along Route 66. The vast migration of destitute people fleeing their former homes actually increased traffic along the highway, providing commercial opportunities to a multitude of low capital, mom-and-pop businesses. World War II caused a marked decline in civilian and tourist traffic, but it stimulated new business along U.S. 66, when it acted as a military transport corridor moving troops and supplies from one military reservation to another. Motels saw an increase in occupancy, as families of servicemen stationed at military bases stayed for long stretches. But more significantly, Route 66 facilitated perhaps the single greatest wartime mobilization, as thousands of jobseekers headed to California, Oregon, and Washington to work in defense plants. When the war ended, traffic increased as rationing and travel restrictions were lifted. Automobile ownership grew dramatically over the next 10 years, with 52.1 million cars registered in 1955 (compared to the 25.8 million at the end of the war). With more cars and leisure time, families headed west on Route 66 to the Grand Canyon, Disneyland, and the beaches of Southern California. With the heavier traffic, businesses along the highway boomed, and the image of Route 66 as a Dustbowl migration route changed to one of freedom and kicks. The bleak image of John Steinbeck's Grapes of Wrath faded as the upbeat lyrics of Bobby Troupe’s “Route 66” hit the airwaves. The adventures of two young men seeking their kicks in the 1960s television series, Route 66, further immortalized Route 66 as a highway of thrills. Just as the enormous traffic in the decade after World War II sent Route 66 into a boom time, the popularity and crowding of the highway signaled its demise. In 1956, President Eisenhower, who had witnessed the military advantages of the German Autobahn during World War II, supported the passage of a law to construct a new system of high-speed, limited-access, four-lane divided highways — today’s interstates. Five new interstates (I-55, I-44, I-40, I-15, and I-10) incrementally replaced U.S. 66 over the next three decades. Interstate construction coincided with the powerful forces of economic consolidation as evidenced by the growth of branded gasoline stations, motels, and restaurant chains. The 1984 bypassing of the last section of U.S. 66 by I-40 led to the official decommissioning of the highway in 1985, impacting countless businesses and communities along the road. In 1990, the United States Congress passed Public Law 102-400, the Route 66 Study Act of 1990, recognizing that Route 66 had “become a symbol of the American people's heritage of travel and their legacy of seeking a better life." As a result of the law, the National Park Service conducted the Route 66 Special Resource Study to evaluate the significance of Route 66 and to identify options for its preservation, interpretation, and use. 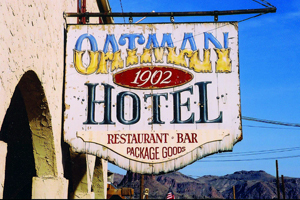 This study led to the enactment of Public Law 106-45 to preserve the cultural resources of the Route 66 corridor and to authorize the Secretary of the Interior to provide assistance. 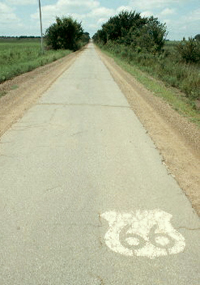 The law authorized the creation of the National Park Service Route 66 Corridor Preservation Program. This program provides financial and technical assistance to individuals; nonprofits; local, State, tribal and Federal agencies; and others to facilitate preservation of the most significant and representative historic resources along the route. In 2008, the significance of Route 66 and the importance of preserving it were again recognized when the World Monuments Fund listed Route 66 on the Watch List of 100 Most Endangered Sites. The Watch calls international attention to threatened cultural sites around the world, and seeks to build capacities and constituencies for the long-term, sustainable protection of those sites. As a result of this listing, World Monuments Fund has partnered with American Express through its Sustainable Tourism Initiative to provide funding to support Route 66 projects, including an Economic Impact Study of Historic Preservation and Tourism, and this Route 66 National Park Service Discover Our Shared Heritage Travel Itinerary.